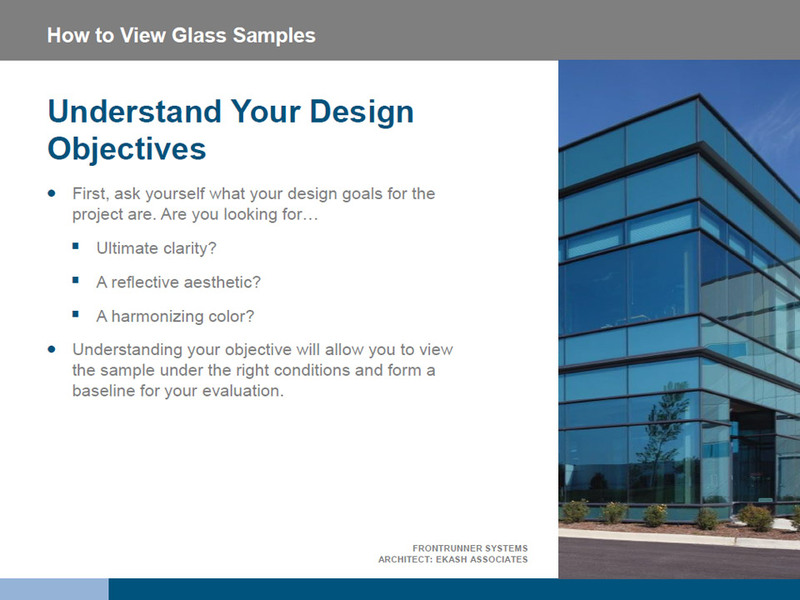 Before evaluating a glass sample, ask yourself what your design goals are for the project. Are you looking for ultimate clarity? A reflective aesthetic? A harmonizing color? Understanding your objectives will allow you to view the sample under the right conditions and form a baseline for your evaluation. 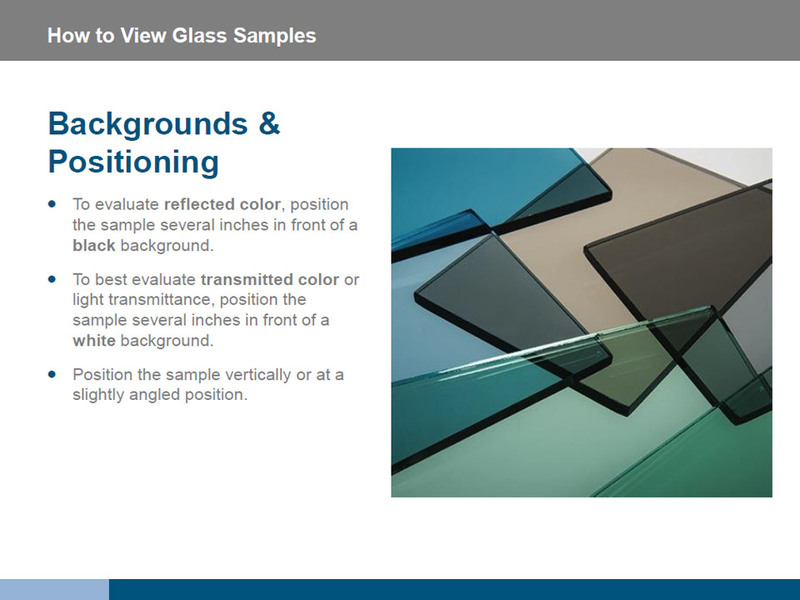 To accurately evaluate the reflected color of a glass sample, position the sample several inches in front of a black background. To best evaluate the transmitted color or light transmittance of a glass sample, position the sample several inches in front of a white background. For the best approximation of how the glass will look when it is ultimately installed, position it vertically or at a slightly angled position. Ensure that you are evaluating the sample from the correct side. 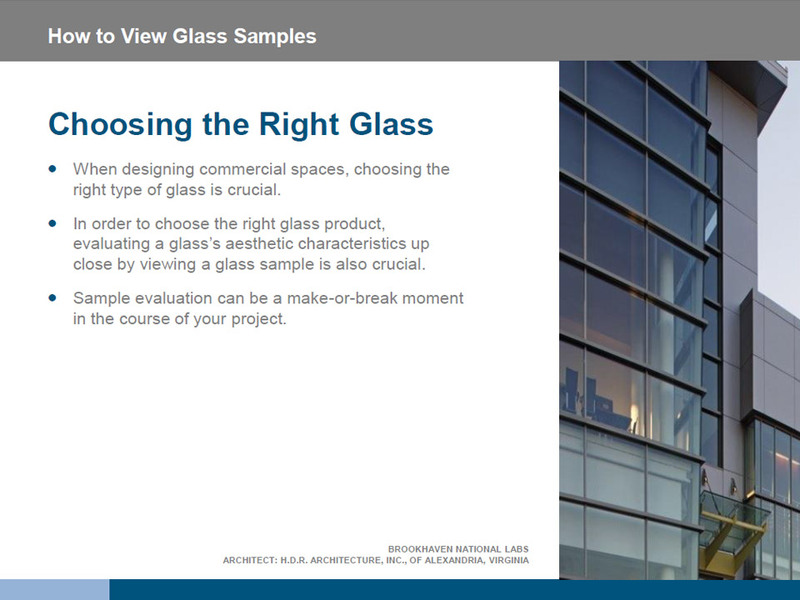 For example, if you wish to evaluate the aesthetic of the glass from the building exterior, be sure that the exterior surface of the sample is closest to you. 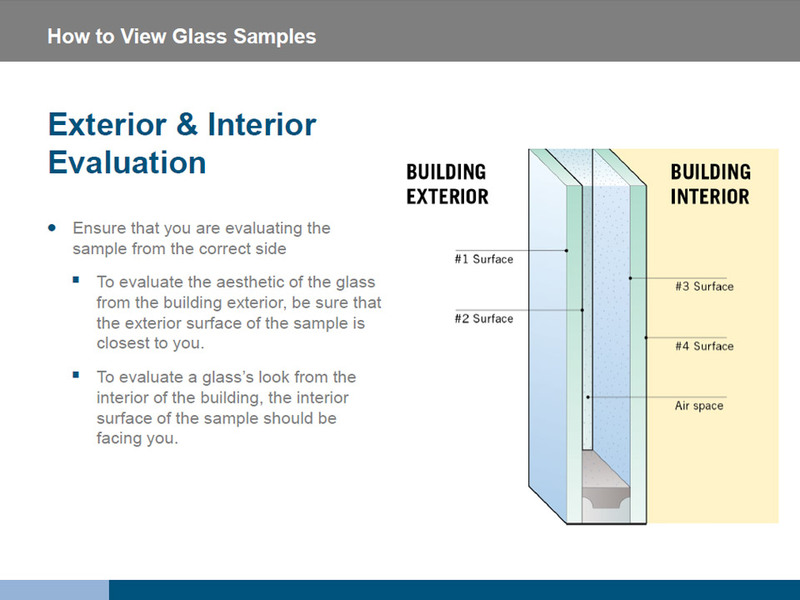 If you wish to evaluate a glass’s appearance from the interior of the building, the interior surface of the sample should be facing you. Light can have a significant effect on the appearance of glass. To replicate the look of the glass in lighting conditions similar to those in which it will be installed, use multiple types of natural or outdoor light to your advantage. 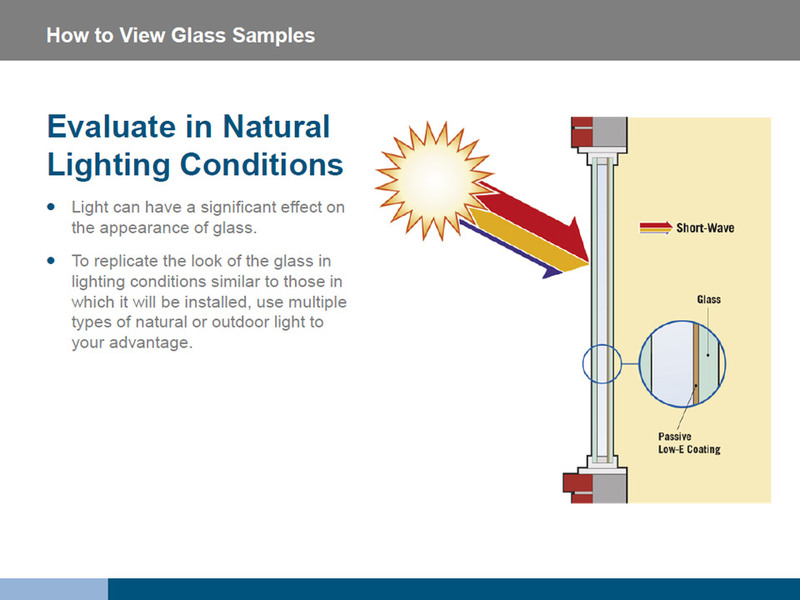 If possible, view the sample in a variety of lighting conditions—particularly in bright, direct sunlight to evaluate glare, and in overcast conditions to accurately evaluate light transmittance and reflected color. 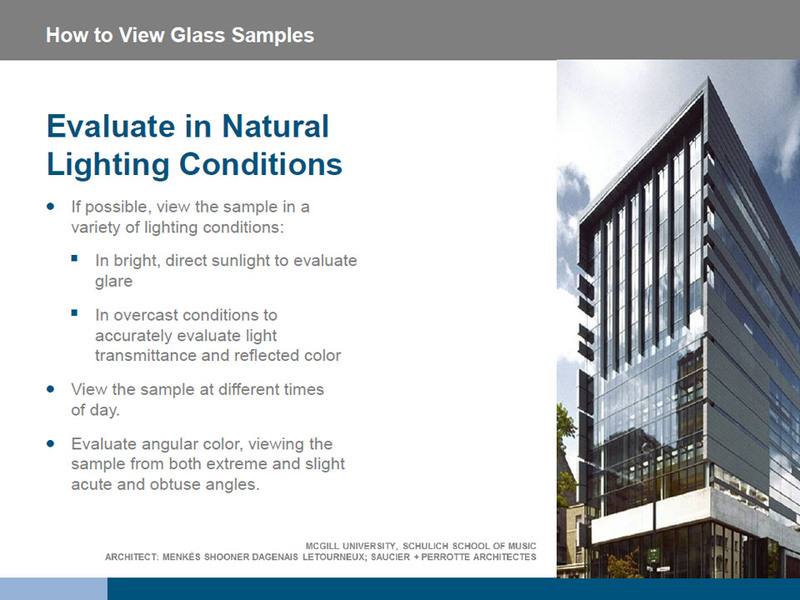 Since time of day also impacts how installed glass appears, it also can be helpful to view the sample at different times of day. It also may be advantageous to evaluate angular color, viewing the sample from both extreme and slight acute and obtuse angles. Glass samples may be available individually or in kits featuring multiple samples, and are typically available in 4" x 6" or 12" x 12" sizes. 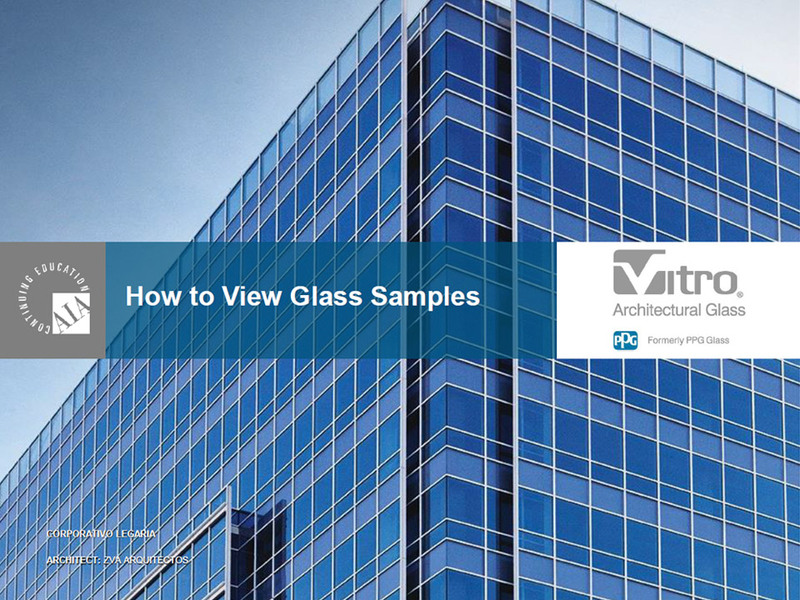 During the schematic design phase of your project—when you are just beginning to envision the possibilities—it is typical to evaluate multiple smaller, 4" x 6" samples, which can provide a comparative baseline for your glass options. 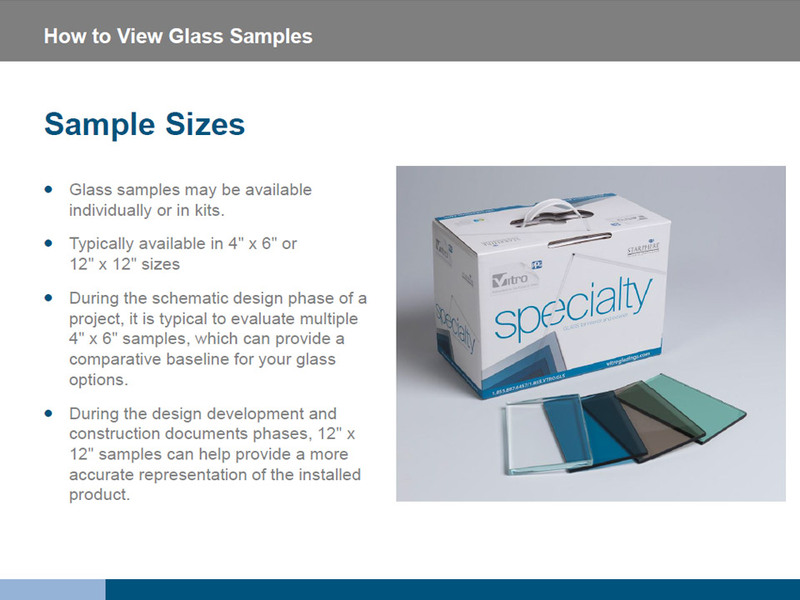 However, during the design development and construction documents phases—when the glass requirements have been set and a specification is required—evaluating a larger, 12" x 12" sample can help provide a more accurate representation of the installed product. Mock-up evaluation is a critical element of working with insulating glass units (IGUs). While a 12" x 12" sample can certainly give you a good idea of the glass’s aesthetics in a general sense, there’s no replacement for evaluating a full-size glass mock-up. 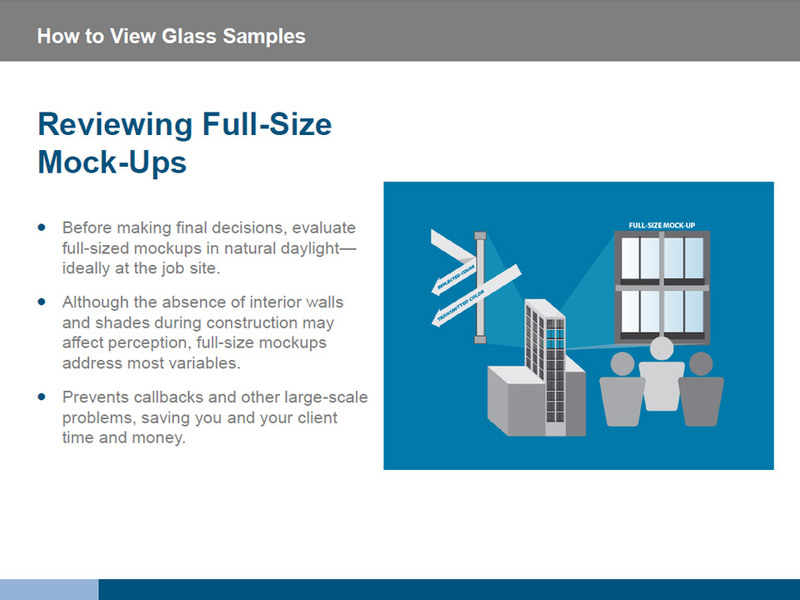 Vitro Architectural Glass (formerly PPG Glass) recommends evaluating full-sized mockups in natural daylight—ideally in situ, at the job site or in similar building surroundings—to ensure that all variables reflect those of the finished building. Although the absence of interior walls and shades during construction may affect perception of glass, full-size mockups address the majority of variables required to make an informed decision and move forward with fabrication. It allows architects, designers, contractors and owners to assess a three-dimensional representation of the IGU, so that functionality, aesthetics and quality can be evaluated. This can prevent callbacks and other large-scale problems, saving you and your client time and money. Have a project? Request samples and evaluate your options. 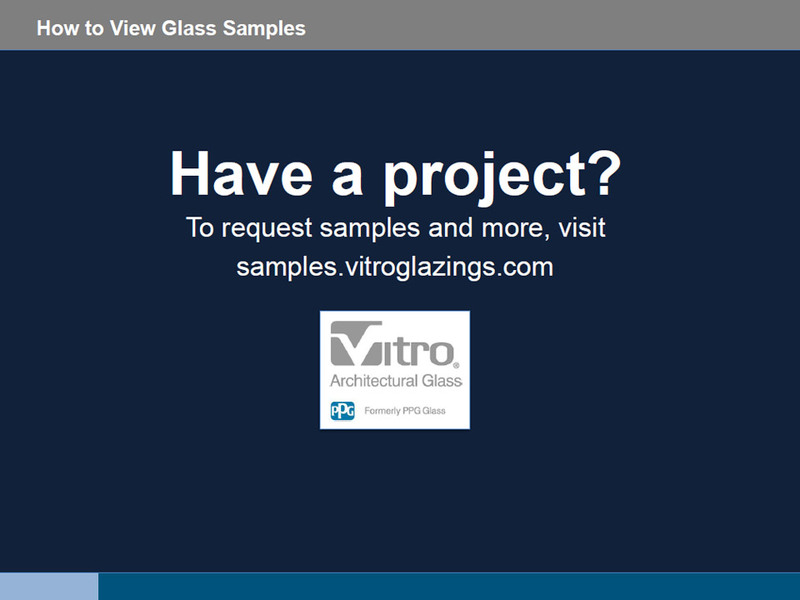 Visit the Vitro Architectural Glass Sample & Fulfillment Center.